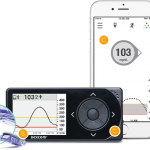 Are you trying to decide between the Dexcom G5 CGM and the Freestyle Libre, flash glucose monitoring system? We are here to help. My son spent a year wearing the Freestyle Libre, and 3 months wearing the Dexcom G5. Now we are ready to outline the pro’s and con’s of each as we compare them side by side. Please note this comparison guide is based on our personal experience. Despite new, Dexcom G5 prices, making the Dexcom system cheaper than ever the set up costs for Dexcom are still considerably more than the libre. 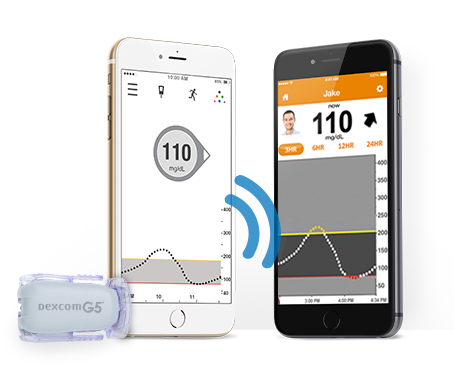 For the Dexcom G5 you will need to purchase a receiver, a transmitter and sensors. For the Libre, you will just need the handheld scanner (reader) and the sensors. To purchase the receiver, transmitter and 2 Dexcom sensors it will cost you £577.50 which is considerably cheaper than a few months ago when the G5 system costed around the £1000 mark. In comparison the Freestyle Libre Starter Pack that contains the reader and 2 sensors will cost £159.95. This is yet another area that the Freestyle Libre shines, the application is simple and virtually pain free. The applicator is rather like a stamp, you fit 2 components together then simply push down and lift off the applicator. Dexcom on the other hand is fiddly and slightly more painful. My son took a real dislike to the applicator and we have to use Emla numbing cream, now using the cream he barely feels a thing. To be honest the applicator looks totally brutal, take a look at the image below, it was no wonder he was so nervous about the application process. The good news however, it seems that a new application device is due out soon. Hooray. With the Dexcom you have to remove one part from the applicator, then push down, then move your fingers under the collar to withdraw. 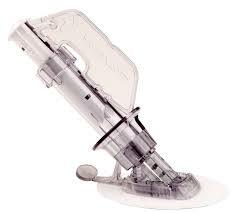 It’s this manual insertion my son doesn’t like, he says he can feel the needle going in and out. Hence we use Emla cream now. He has finally got used to it. The Libre sensor is about the size and shape of a £2 coin and is flat in design, only protruding by a few mm. It has very little tape surrounding the sensor. Therefore it’s very discreet. The Dexcom sensor looks completely different, it’s oblong in shape and the transmitter is clipped to the top of it, therefore it protrudes far more than the Libre. As it’s bigger and heavier it has more tape surrounding, it’s less discreet than the Libre sensor. Freestyle Libre sensors are meant to last 14 days. After 14 days they automatically shut down and sensor life cannot be extended.We had trouble keeping the sensor on for 14 days initially, in the end we used Skin Tac Wipes on the sensor before applying. Once we did this it lasted the full 14 days. Dexcom sensors are guaranteed for 7 days. After this time though sensor life can be extended, by simply stopping the sensor and restarting it. Not everyone can get longer than 7 days for some reason but we find on average we get around 2.5 weeks per sensor. Usually a minimum of 2 weeks and we have had just over 3 weeks out of a couple of sensors. Evenutally they either fail or fall off. As with the Libre we found stickiness to be an issue. No way would we get 7 days out of a Dexcom sensor without additional help. Once again we apply skin tac before application but we also need to use Rock Tape around the sensor to keep it firmly in place. The Freestyle Libre is factory calibrated therefore there is no need for finger pricks in order to calibrate the sensor, the downside to this, if you are struggling with the accuracy of a particular sensor there is no way to bring it more in line with your meter. Dexcom on the other hand requires 2 finger prick calibrations a day. We do them first thing in the morning and last thing at night. This did feel like a step backwards from the Libre. However because of this we do find the readings do match more closely with our meter. In order to view your latest reading, with the Freestyle Libre you have to manually scan the sensor, this then displays the current reading and displays a line graph of the day so far, along with trend arrows showing if your blood glucose is steady, rising or falling slowly, or rising and falling fast. Dexcom users have 2 choices, you can either look at the latest result and graph on the receiver or on an iPhone app. We rarely use the receiver and rely on the iPhone app. From the app you can view the graph as a 3 hour, 6 hour, 12 hour or 24 hour graph. We like the 3 hour graph as it gives a good indication of how bloods have been moving in the last few hours. It shows a dot for every 5 minutes, this really helps you to work out what action needs to be taken and helps you predict how long it will be before you go out of range. There is also a wider range of trend arrows available, such as falling and rising really fast, double arrows up or down. Alarms are where Dexcom really come into there own. You can customize alarms for highs and lows, you can even set alarms based on how fast levels are rising or falling. There are also repeat settings, so if you’ve corrected a high, you can then set Dexcom to alarm after a given length of time if your child still has high levels. The same applies to lows. We have our range set pretty tight at 4 and 8. Therefore we do get alarms of some kind most nights, however sometimes we get no alarms at all and I finally manage to sleep through the night. I also manage better quality of sleep as I know I have a guardian angel looking out for my child. This is why I’m prepared to pay more money for the Dexcom than the Libre. It’s game changing. In comparison the Libre doesn’t have any alarm features. Providing both your child and yourself have an iPhone you can remotely monitor your child’s levels via your phone. However you will both require internet access of some kind, either wifi or airtime data. This is brilliant as my son can be at school and I can monitor his levels on my phone throughout the day and text him if I need him to intervene. I can keep my phone beside my bed at night and glance at levels through the night if I wake up, also safe in the knowledge that my phone will alarm any time he goes high or low (provided we both have internet access and the sensor is fully working). There is no official remote monitoring feature for the Freestyle Libre, however an Android app has been developed (NOT BY FREESTYLE) to allow users to scan using their phones instead of a reader, you can also now set up Nightscout for the Libre, this allows you to remotely monitor the data, however the app and Nightscout are not medically approved but are widely used, for sure it’s a fascinating move forwards, surely it’s only a matter of time before an official version becomes available. Remember though if you choose this route, your child will need to scan for you to see the latest results, if your child doesn’t scan for a few hours, you will not see data during that time. The Freestyle Libre has it’s own software that you can download for free. It offers a wide range of useful reports. You can even download the raw data so you can see every single reading through the day. 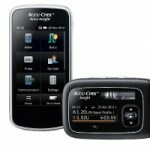 Alternatively you can upload all the data to Diasend which is one of the leading Diabetes software brands. It’s simple to do either, once installed you just attach the reader via a USB cable to your computer. The Dexcom G5 is designed to work with Diasend also. If you are using iPhones you can even set it up to upload automatically each day to Diasend without you doing a thing. Data can then be reviewed either via Diasend desktop or you can see an overview using the Diasend App. Uploading data doesn’t get any easier than this. For the year we were using the Libre we were thrilled with it, without a doubt it’s much better than using finger pricks alone. Seeing all this data is truly eye opening. I liken finger pricks to moving around all day with a blind fold on, being allowed to remove the blind fold for just a moment a few times a day to see where you are now…however that is no reflection on where you have been or where you are going. Once you get to see data either by using a Freestyle Libre, Dexcom or any other CGM it’s like walking around without the blind fold. You can see it all. As for the winner in this comparison, for us alarms and the display features of the Dexcom G5 make it the winner for our family, however it’s clear that in some cases the Freestyle Libre has benefits over the Dex. There is a place in the market for both of these products, in fact there is a place in our lives and home for both of them too. 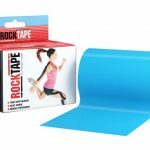 Last week my son has decided he doesn’t want to wear Dexcom right now as the weather is improving and he doesn’t want the bulkier sensor to be seen, he is at the body conscious age, therefore as much as it pains me we are going to use the Libre through the summer term at school and cover it with Rock Tape so it can’t be seen by curious kids. 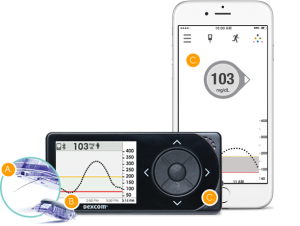 We’ll move back to Dexcom hopefully in the holidays or the Autumn term…..I can’t wait. 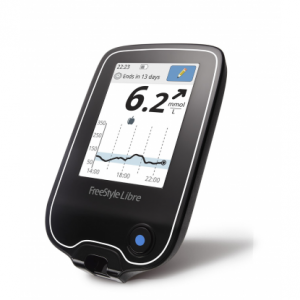 If you’ve found this comparison guide of the Freestyle Libre and the Dexcom G5 useful, don’t forget to subscribe to our FREE newsletter to be the first to hear of the latest Type 1 news from Children With Type 1 Diabetes. Just pop your email address in the box below. Does CGM Improve HBA1C in Children?